In this Photoshop tutorial, we'll learn how to create the illusion that a single photo is being displayed as a series of vertical panels. It may look complicated, but as we'll see, it's actually a very easy effect to create, with many of the steps being simple repetition. 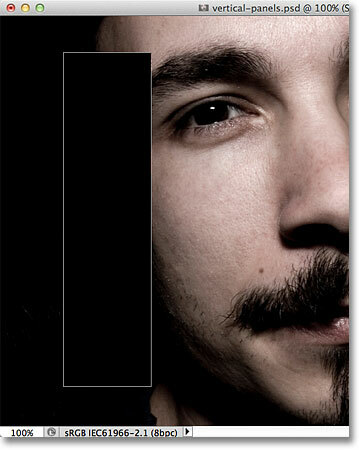 This version of the tutorial is for Photoshop CS5 and earlier. For Photoshop CS6 and CC (Creative Cloud), you'll want to check out our fully updated version. Click on the New Fill or Adjustment Layer icon. Choose a Solid Color fill layer from the top of the list. Choose white from the Color Picker. The document is now filled with white. 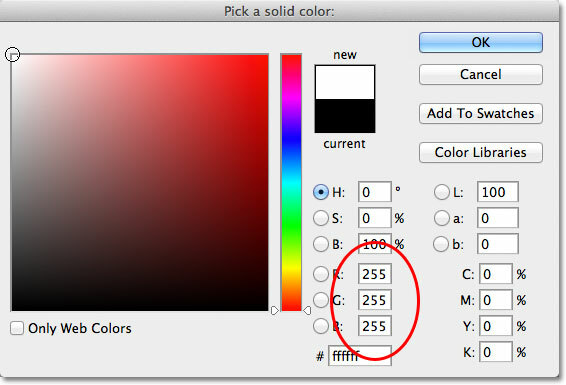 Photoshop places the Solid Color fill layer above the Background layer. Click on the Background layer to select it. Selected layers are highlighted in blue. Go to Layer > New > Layer via Copy. The Background copy layer is added between the original Background layer and the Solid Color fill layer. 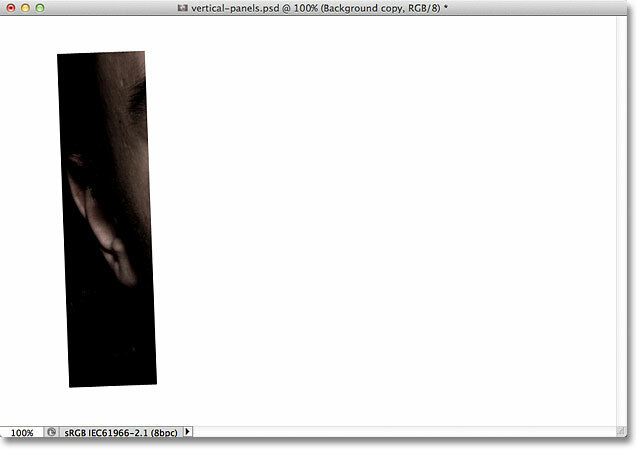 Press Ctrl+] (Win) / Command+] (Mac) to jump the Background copy layer above the Solid Color fill layer. Select the Shapes option in the Options Bar. Dragging out the first panel on the left side of the image. Use Free Transform to rotate and/or move the panel inside the document. The Shape layer currently sits at the top of the layer stack. 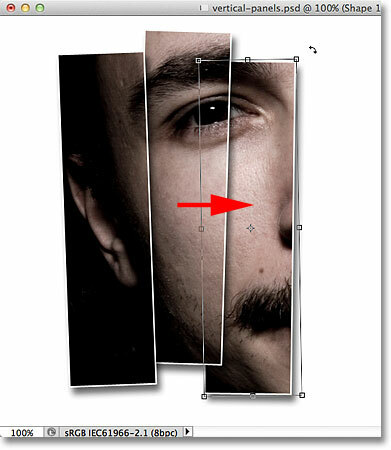 Press Ctrl+[ (Win) / Command+[ (Mac) to move the Shape 1 layer below the Background copy layer. Click on the Background copy layer at the top of the layer stack to select it. 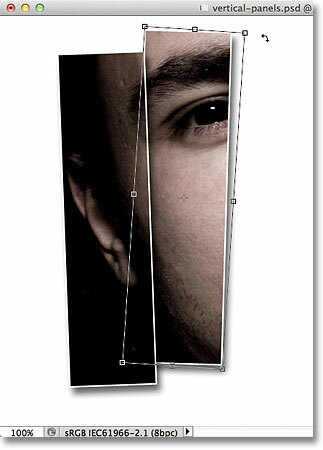 Go to Layer > Create Clipping Mask. 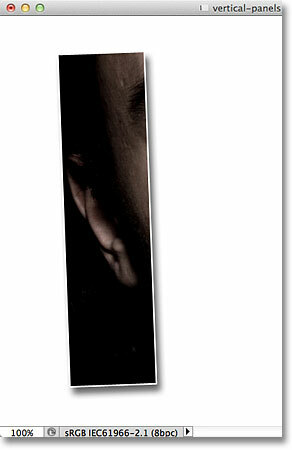 Only the part of the image that appears over the panel shape remains visible in the document. A layer indented to the right means it's clipped to the layer below it. Click on the Shape 1 layer in the Layers panel to select it. Click on the Layer Styles icon. Choose Drop Shadow from the list. The image after adding a drop shadow to the first panel. Click directly on the word Stroke on the left of the Layer Style dialog box. Click on the color swatch. 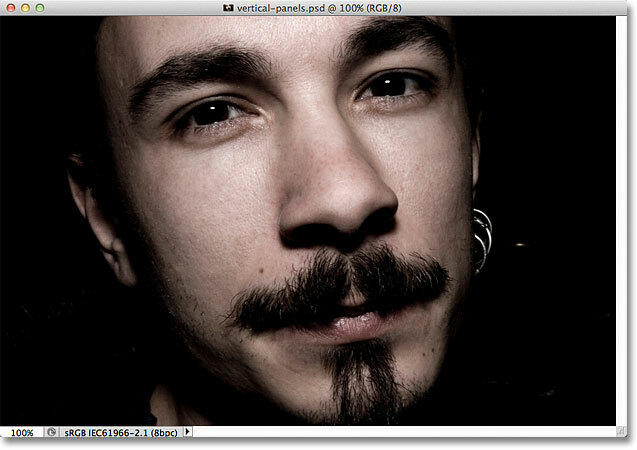 Set the Size to 2 px and the Position to Inside. 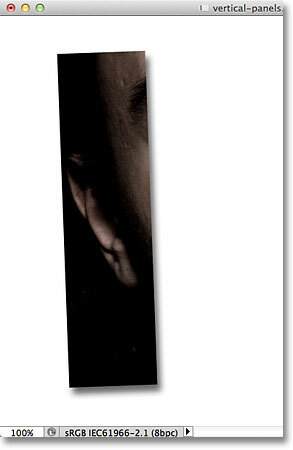 The first panel after applying a drop shadow and a white stroke. Hold Shift and click on the Background copy layer to select it and the Shape 1 layer. Go to Layer > New > Group from Layers. Name the new layer group "Panel". The two layers are now inside a layer group named Panel. Click and drag the Panel group down onto the New Layer icon. A copy of the Panel group is added above the original. Press Ctrl+[ (Win) / Command+[ (Mac) to move the Panel copy group below the original. Click on the triangle to twirl open the Panel copy group. Select the Shape 1 layer inside the Panel copy group. 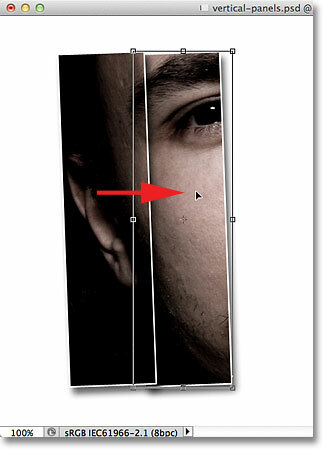 Click inside the panel and drag it towards the right to reveal more of the image. Rotate the second panel slightly in the opposite direction. Close the layer group when you're done to keep things looking clean and organized. Drag the bottom-most layer group down onto the New Layer icon. Photoshop adds the copy of the layer group directly above the original. Press Ctrl+[ (Win) / Command+[ (Mac) to move the new copy below its original. Open the layer group and select the Shape 1 layer. Use Free Transform to move and rotate the panel. Click on the triangle to close the group when you're done. And there we have it! 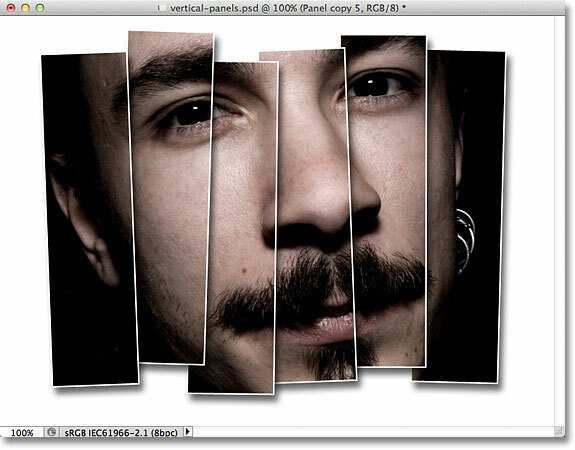 That's how to display a single photo as a series of vertical panels with Photoshop! Visit our Photo Effects section for more Photoshop effects tutorials!